Radio signals with an ultrawide bandwidth are very well suited for indoor localization due to their fine time resolution. On its way from transmitter to receiver, a signal undergoes several electromagnetic interactions, such as reflections on room walls. Using UWB signals, many of these reflections are resolvable. In the literature, such reflections are often only seen as impairments, as their presence can lead to large positioning errors. A major goal of this thesis is to exploit the inherent localization information that those reflected signal paths carry. This can be done for example via the usage of floor plans, with which reflected paths can be mapped to virtual anchors. 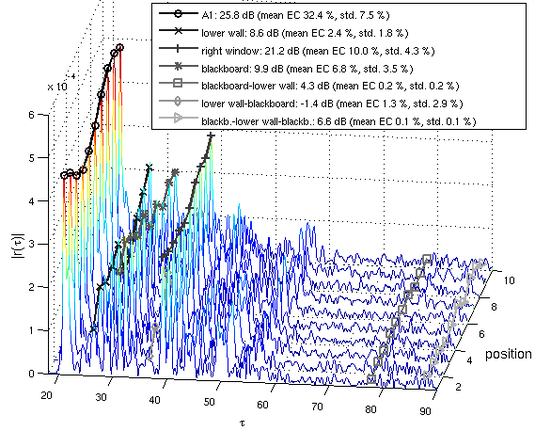 Bayesian estimation techniques are used in conjunction with simulated and measured data to develop algorithms that can extract, track and map the reflected signal paths. Also of interest are channel analysis techniques that allow for a quantification of the amount of location-dependent information in a measured UWB CIR. Therefore, measured channels are decomposed into deterministic specular reflections and components resulting from diffuse scattering. Within this thesis, the MeasureMINT UWB-channel measurement campaign database has been obtained to allow for in-depth channel analysis and for a detailed evaluation of tracking algorithms. Also, a live-demonstration system that shows the capablilities and benefits of using multipath is developed.